I love this time of year when the season changes from winter to spring. The birds are chirping, the flowers are blooming, the trees are blossoming, the grass is turning green, the birds are laying their eggs, and the animals are coming out of hibernation. The breezy air is cool and refreshing and has a strong and wonderful fragrance. Reds, yellows, purples, pinks and whites pop out and color the landscape. The snow begins melting and the rivers rushing and raging with water. The fluffy clouds come and go sometimes dropping rain upon the earth and nourishing the landscape. The sun begins shining and warming the ground. Spring is an active month. It is full of change and wonder. Promises and new life. Rebirth. Contrast spring to winter. Winter is a harsh month. The earth is barren and dormant. Grey and dull. Cold and harsh. A fresh blanket of snow can be so beautiful and pure on an otherwise colorless landscape. The earth seems to stand still and frozen in time. Everything seems lifeless. And the winter months sometimes seem to drag on. Then, slowly but surely, a bud pops out. The blades of grass change color. A blossom opens. A leaf sprouts. And life begins again. Nature reminds us of Jesus and His work on the cross. Jesus experienced summer. He watched his ministry and outreach grow and thrive. He gained many followers. He showed people the power, love and glory of God. He let God’s light shine brightly and warmly before men. Jesus went through the season of fall too. He asked God to take the cup from Him, but He knew what He had come to Earth to accomplish. Instead of being stripped of leaves and whipped by strong wind, Jesus was stripped of His clothing and severely beaten. He had insult after insult hurled upon Him. He was broken, bruised, bleeding and crushed for our iniquity. Jesus also experienced winter. He was nailed to a cross, willingly endured pain and anguish, separated from the Father by our sins, and as the lamb led to the slaughter, he was killed. The Son of God, who knew what He would go through when He first left heaven, had died. His work was finished. The sky drew dark and the earth shook. Nature gave a strong cry out to what had just taken place. Thankfully, the story of Jesus doesn’t end in the winter months! Jesus’ mother Mary and Mary Magdalene certainly thought winter would be around longer. They went to tend to the body of Jesus. Instead they saw that the tomb was empty. They were frightened and confused. Thankfully an angel clued them in and eventually Jesus Himself appeared to them. He had resurrected from the dead. He had risen. Just as Jesus rose again, we too have the opportunity to die to self and live for Christ and to be reborn into God’s kingdom. And when we die, we will trade our earthly bodies in for new heavenly bodies and join Jesus in heaven. Springtime is all about rebirth, and it tells the story of Jesus! As we head into Easter weekend and you think about what Jesus has accomplished for the whole of humanity, be like nature during early spring and cry out to God! Praise Him, worship Him and thank Him for His sacrifice on the cross and the hope of eternal life only found in Christ Jesus our eternal, divine and risen Lord and Savior! Let hope spring forth in you! 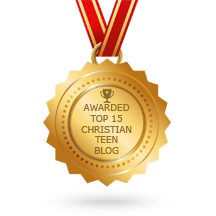 This entry was posted in A CLICK A BLESSING TODAY, CHRISTIAN TEENS BLOGS. Bookmark the permalink. Dearest, Christine, what wonderful analogies between the rebirth of the earth’s life in the spring after the harsh winter and the “deadness” and the wondrous New Life forever and ever brough into the world by His Resurrection after that harsh death on the cross! Love this post. Blessing and prayers for you and yours this Easter Week! Amen! and Amen! O praise the Lord for He alone is worthy to receive glory, honor and worship..